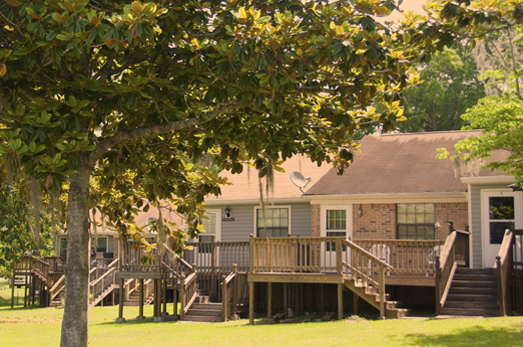 The Cottages are the ultimate in lakeside living with all the cozy comforts of home. They have an open floor plan with a full kitchen with dishwasher, dining area, living room, and vaulted ceilings for a kickback spacious feel. The layout includes one bedroom / one bath, satellite TV, internet, and a washer & dryer. The cottages are ideal for up to two guests. Max per cottage 4. Click here for Rates and Reservations. Pets and smoking are not permitted in the Lodge or the Cottages. For more details and to make reservations: Phone: 850-875-2605. Email: fishtalquin@gmail.com.